Concept artwork for the GRAC exterior. The Gippsland Regional Aquatic Centre (GRAC) is the centrepiece of the Latrobe Valley Authority’s $85 million sports and infrastructure package. 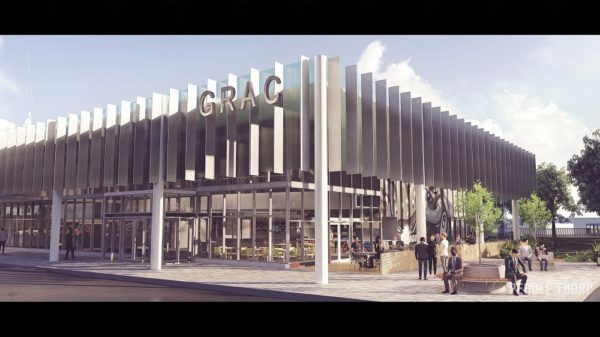 The $57 million Gippsland Regional Aquatic Centre (GRAC) is the centrepiece of the Latrobe Valley Authority’s $85 million sports and infrastructure package. It will allow Latrobe City to fulfil its long held desire for a facility of this type for its constituents. The centre will feature a range of facilities for competitive swimming, leisure, general community use and major regional events, including an eight lane 50 metre indoor swimming pool with 500 spectator seats. Concept designs for the Gippsland Regional Aquatic Centre. 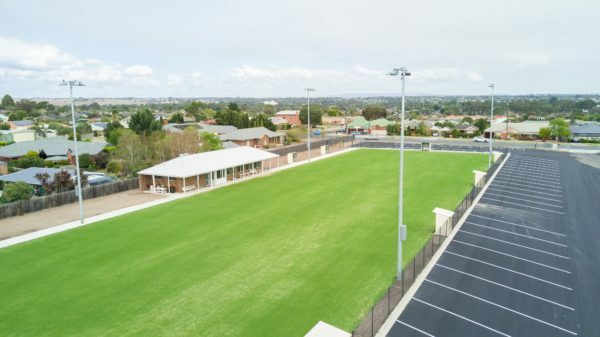 On top of $46 million in State Government funding, an additional $8 million has been loaned to Latrobe City Council from Sport and Recreation Victoria’s Community Sports Infrastructure loan scheme to ensure all desired components of the project are included. 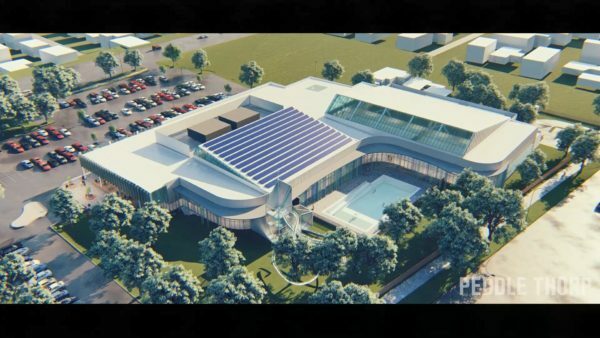 This, combined with a contribution of up to $3 million from LCC, meant the 25 metre outdoor pool, geothermal infrastructure and water slides could be included in the final scope of the project. This project has strong community support, and was designed in consultation with local residents, key user groups and stakeholders. ADCO Constructions is on site and work has begun on the GRAC. Work is now underway on the Gippsland Regional Aquatic Centre. Design and construct tender winner ADCO Constructions took control of the site on 18 March. The outdoor pool has been drained and fencing and site establishment is underway, with demolition, asbestos removal and piling to follow. An 18 month construction phase is projected with a completion date of December 2020 for an early 2021 opening. Council worked with key stakeholders such as Swimming Victoria to refine the scope of the aquatics components along with a nine-person Project Reference Group (PRG), taking inspiration and learnings from comparable centres across the state. Concept artwork for the GRAC interior. 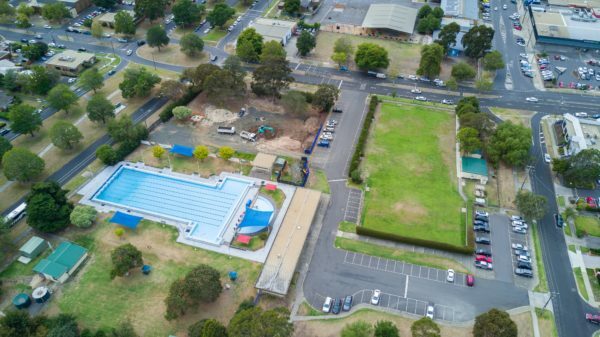 Feedback from community consultation was utilised in developing plans, with Latrobe City residents highlighting an indoor warm pool, spa and sauna as the top priorities beyond a 50 metre indoor pool with seating. The Industry Capability Network and GROW Gippsland have been engaged extensively in order to maximise local content on the project and have assisted with the tendering process. At the height of the build, it is anticipated there will be up to 120 workers on site including strong representation from local sub contractors. GRAC will use 90 per cent local content as a designated Victorian Industry Participation Policy initiative. The PRG will continue to act as a key conduit between Council and community in the planning and delivery of the GRAC. The new Traralgon Croquet Club site at Glenview Park. The grass is greener for the Traralgon Croquet Club (TCC) on the other side of a move to the Glenview Park sporting precinct. An agreement was reached between Latrobe City Council and TCC to develop a new croquet facility alongside the Traralgon Greyhound Racing Club and Latrobe Valley Racing Club at McNairn Road. The previous Breed Street centre is more than 60 years old and has limited capacity to host large events and simultaneous play. The new site includes lighting to enable evening play, a new clubhouse and courts designed to maximise local usage and attract major competitions. Construction is now complete and the new facility is ready for handover. The former croquet club site will be utilised as part of the GRAC development.